To be less influenced by stale rhetoric and more in touch with Libya’s present reality, it is useful to recall why the civil war erupted in the first place. Much of it had to do with Haftar launching his Operation Dignity against any and all proponents of political Islam, moderate and hardline alike. Haftar didn’t launch his initiative in a vacuum. The retired general emerged as a key military leader in large part because several foreign states were intent on ridding Libya of any organized manifestation of political Islam. They therefore needed a conservative military man with a simple discourse. Among those foreign states, the most virulent ones were the UAE, Egypt, and Saudi Arabia (not coincidentally the same countries that constitute ¾ of the quartet blockading Qatar.) France and Russia hopped on the Haftar bandwagon a bit later. Now it is worth asking whether Haftar is still as uniquely qualified for the anti-Islamist job as he was in 2014? He and his sons will insist that the 75-year-old is the only leader who can fix Libya. Yet that storyline is becoming less plausible. The new initiative’s most important feature is its international dimension. Not only are the talks being spearheaded by the Egyptian military, but the French, the Saudis, the Emiratis and others are also involved. This is a profound game changer: the main foreign capitals are now overtly in contact with anti-Islamist figures based in the western half of Libya. One of many western Libya leaders is Usama Juwaili, a 58-year-old Zintani officer aligned with the internationally-recognized government in Tripoli. The former defense minister has conducted several ground operations across northwest Libya since November 2017. He also claims to be bolstering border security near Ghadames, the Libyan town near both Tunisia and Algeria. Juwaili is not eager to be subordinate to Haftar but his supporters know he is committed to combating political Islam and its allies. Other important western Libyan opponents of political Islam garnering further recognition at the Cairo talks are leaders of powerful Tripoli militias, such as Haythem Tajouri, Hashem Bishar and Abdelrauf Kara. Since 2016, these leaders of armed groups – often using aid quietly received from foreign states – have made substantial headway pushing Islamist figures out of the capital. The effort is appreciated by many entities in and out of Libya. The headquarters of the Central Bank of Libya (CBL) and the National Oil Corporation (NOC) are located in Tripoli, not to mention the Government of National Accord (GNA), Libya’s only internationally recognized government, as well as many Western embassies. While Haftar is consumed with long-standing security crises in Derna, Ajdabiya, and Benghazi in eastern Libya, and is trying to exploit the local clashes in Sebha, a key southern Libyan city, other anti-Islamist leaders in Tripolitania are more regularly engaging with foreign capitals in a direct and official manner. This development is likely to transform the Libyan conflict. Almost two-thirds of Libya’s population lives in Tripolitania, the country’s northwest quadrant, which is (and is likely to remain) beyond Haftar’s grasp. If only for the sake of rhetorical continuity, the UAE and other anti-Islamist governments may wait a while before discarding Haftar. After all, he is still expected to hold eastern Libya and that’s not unimportant. But the relationship is already more about aloof politeness toward the man and his sons than diehard loyalty. The family has taken too long to deliver too little for its foreign sponsors. The latter are unlikely to wait forever when other, less polarizing Libyans have already begun working on an Islamist-free Tripolitania. 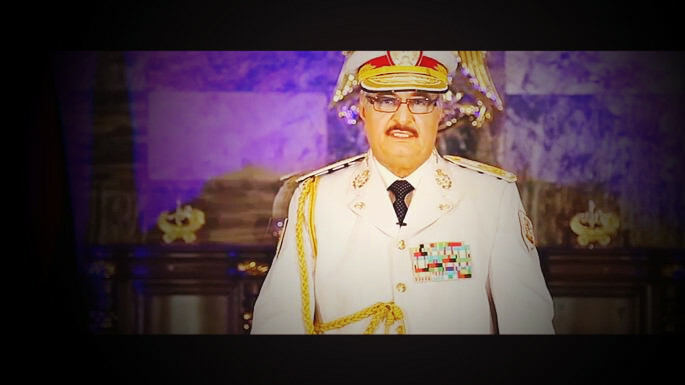 Perhaps the most apt way of beholding Libya circa 2018 is to imagine Khalifa Haftar confined to a secondary role.